Revisiting Mother Teresa’s words on her birth anniversary (August 26, 1910 – September 5, 1997), a Saint above all, for she embodied what we refer to as the almighty based on our faith, circumstances and value-systems by her lifelong commitment to the needy and the people in distress, for she saw her almighty in every human being. Her every word, every quote reflects it. The last few years have been tough and her words have always come to show me the light. 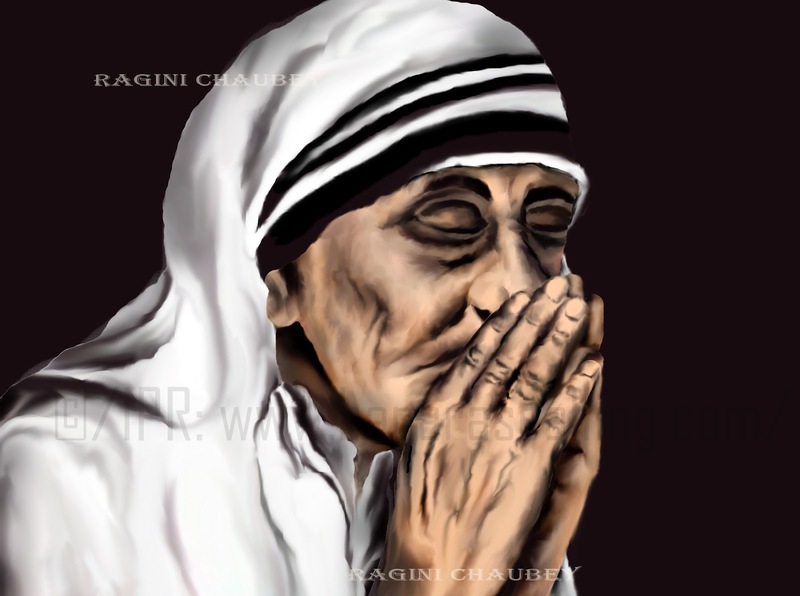 Here I am quoting from her Nobel Peace Prize lecture that she delivered on December 11, 1979 along with a digital painting of the Holy Mother by my sister Ragini. We have been created to love and be loved, and then he has become man to make it possible for us to love as he loved us. He makes himself the hungry one - the naked one - the homeless one - the sick one - the one in prison - the lonely one - the unwanted one - and he says: You did it to me. Hungry for our love, and this is the hunger of our poor people. This is the hunger that you and I must find, it may be in our own home. As that man whom we picked up from the drain, half eaten with worms, and we brought him to the home. I have lived like an animal in the street, but I am going to die like an angel, loved and cared for. And it was so wonderful to see the greatness of that man who could speak like that, who could die like that without blaming anybody, without cursing anybody, without comparing anything. Like an angel - this is the greatness of our people. When I pick up a person from the street, hungry, I give him a plate of rice, a piece of bread, I have satisfied. I have removed that hunger. But a person that is shut out, that feels unwanted, unloved, terrified, the person that has been thrown out from society - that poverty is so hurtable and so much, and I find that very difficult.